I use the GMC-320+ in the operating theatre. During the fluoroscopy I place the GMC 320 right where I am (just a bit more than one meter far from the X-ray source). The X-ray fluoroscopy can last more than 10 seconds and the whole operation can take easily 10-20 minutes of fluoroscopy. I bought the 320+ and didn't calibrate it. The background CPM uses to be 30CPM. During a fluoroscopy I see that the CPM are over 10.000 (30.606 CPM on the image attached). Is this value correct? 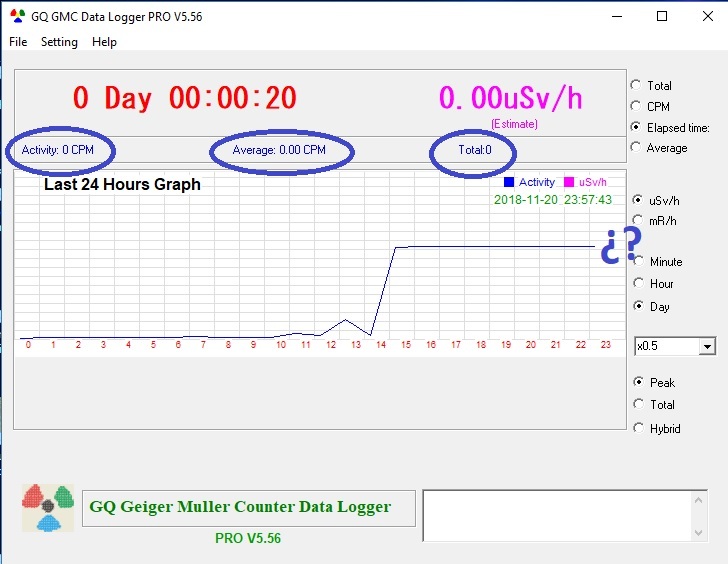 I have installed either the GQ GMC Data Viewer software and the Data Logger Pro. and I see that either the Activity,Average and Total are 0 CPM (image attached) while the graph shows high doses of radiaton measured. Why are these values set to 0 ? On the graph data is displayed on a X and Y axis, Time is shown on the X axis. 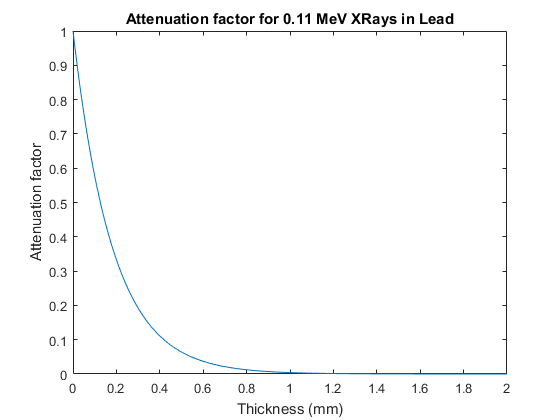 Radiaton is shown on the Y axis but there is not a caption on the Y axis showing in numbers the radiation. 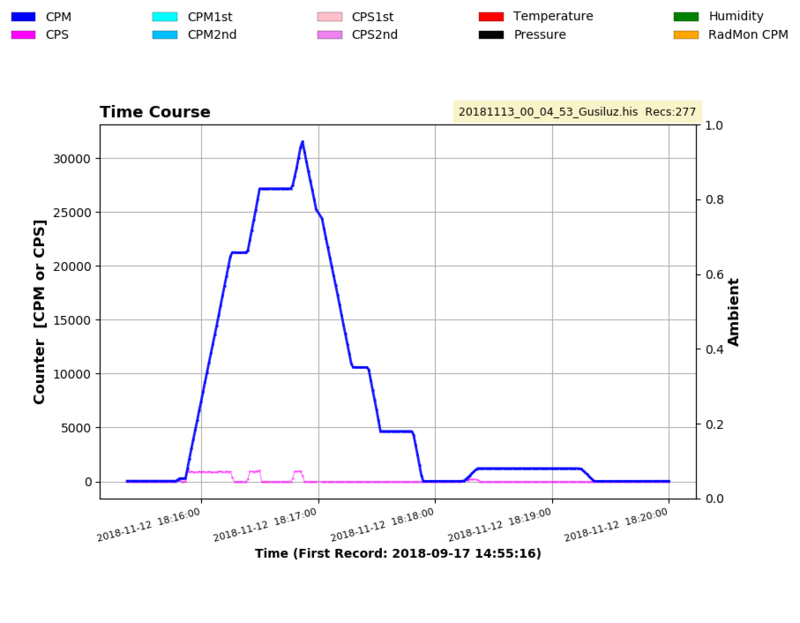 And a last question: On the data Viewer software "Maximum" and Minimun" are peaks in uSv/h? The Data Viewer software is a bit cumbersome, to say the best. 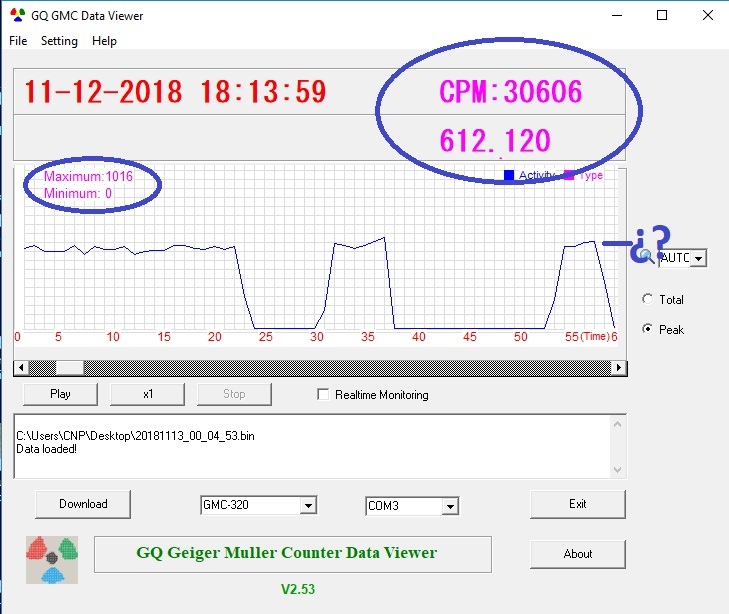 I recommend you to open the .bin file with GeigerLog (see here http://www.gqelectronicsllc.com/forum/topic.asp?TOPIC_ID=5401). Many of your questions about the data will be answered when you parse it with GeigerLog. On the other hand, I suppose that you were recording every second, because that is important for short timed sources. 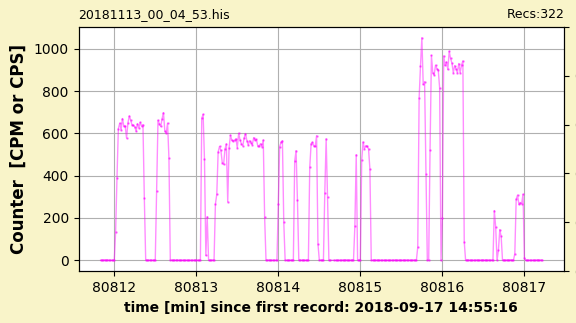 But 36 kCPM is not that odd close to an X-ray source, and it would probably be more intense than that if those 36000 counts happened in only 10 seconds (210 kCPM). Are you the patient or the doctor? If you are the doctor, that sounds like a lot of exposure, although the energy of the X-rays is also important for the exposure. In airport security machines, xray counts are massive, but probably of a few tens of keV. I am trying my best with Python to run the Geigerlog software but I don't know how to execute it. I tried executing "cmd" (MSDOS) I know how to run a file but don't know how to run a folder. I tried to run it via Python but I don't know the set of commands to run GegigerLog. I am the fluoroscope operator (Radiographer) as I work with Xrays I decided to record each second. For fluoroscopy of abdomen I work with 80KeV photons, ampers -which are the key for the dose- are calculated by the fluoroscope and it also calculates the dose for the patient (in a 10-year-old fluoroscope the dose for 13 minutes of fluoroscopy uses to be 0,5-0,7 Gray, a bit high. Ten times less with a new fluoroscope, 50mGy). And according to the inverse-square law, at one meter of distance from the Xray source, we are done. So, that's the reason why I would love to run the GeigerLog Python based software, to see in detail the CPM and dose for each second. OK, that is interesting! So you have acess to an XRay machine and you know the energy of the photons! We could use that to calibrate the M4011 tube inside your device. Could you share the .bin file (upload to dropbox or something like that and post the public link) and give us more information about the measurements? 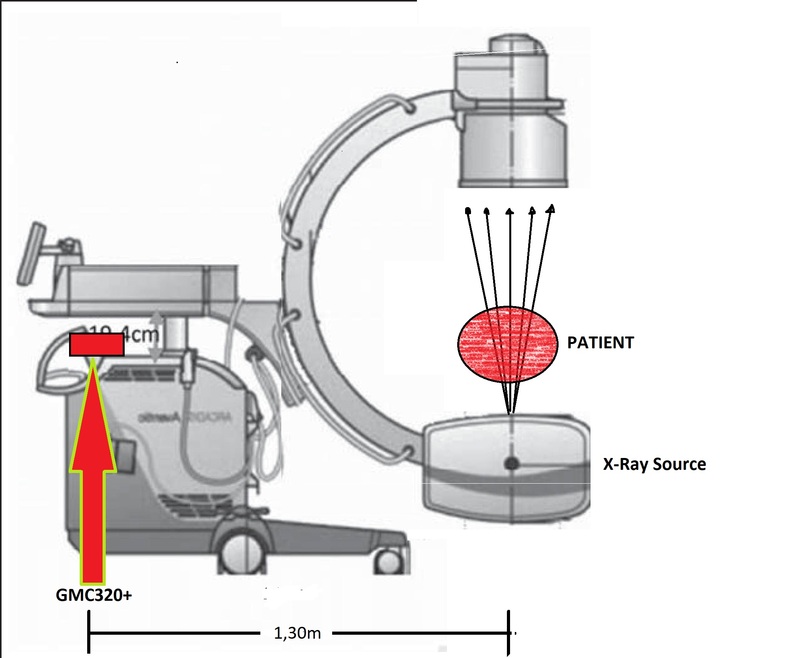 Did you use the old or the new xray fluoroscope for the measurements? Was the machine indicating the dose in Grays and how long was the exposure? I suppose that the emission is not spherical, so it will be more focused to the patient, and therefore the inverse square law does not work if you are not in direct view of the xray emitter. Can you show us an schematic of the layout of the xray emitter, the patient and the point of measurement where you recorded the data? For the data viewer The 30606 is the current CPM, the 612.120 is the dose in uSv/h but need to check the calibration to confirm. The the maximum is the maximum CPS. Need to click on total to check these values. 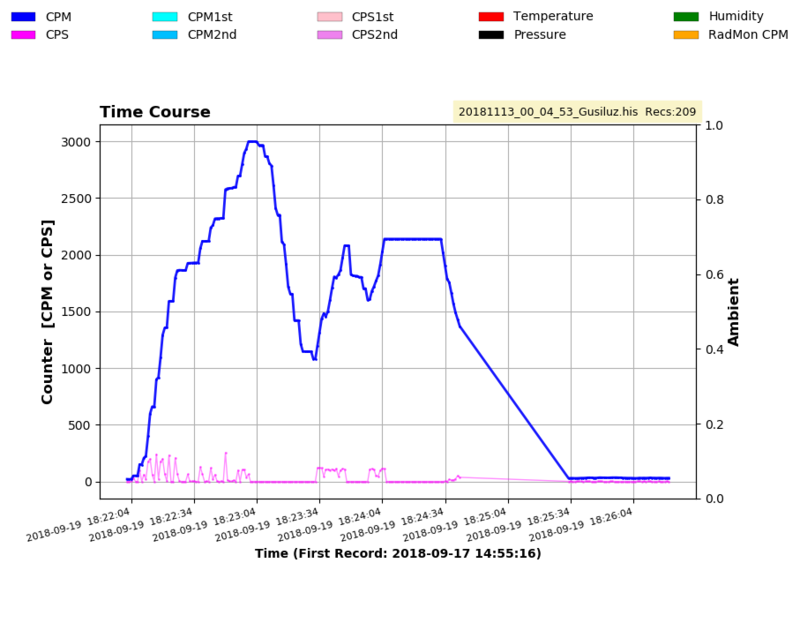 For the data logger pro, Is this data from a downloaded file? or live? I used the new fluoroscope. The machine indicates the dose in Grays. There were two operations -both with the same machine- for the first one the exposure lasted more than ten minutes in discontinued intervals during two hours. I am reading the step by step procedure and your tips to install GeigerLog Python based software, hope to have it ready asap. The data is from a downloaded file from the GMC device. @Gusiluz: That is a great data collection! See some pictures below. 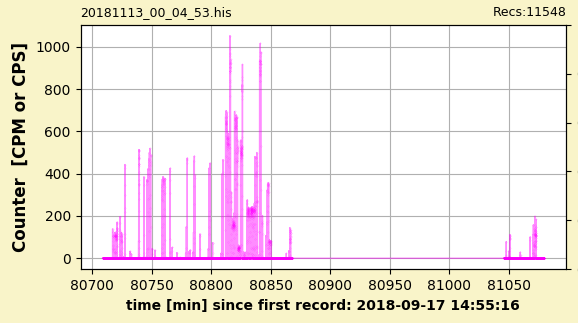 I have to analyse all the data, but it seems that the peaks are of almost 1000 CPS during a few seconds. 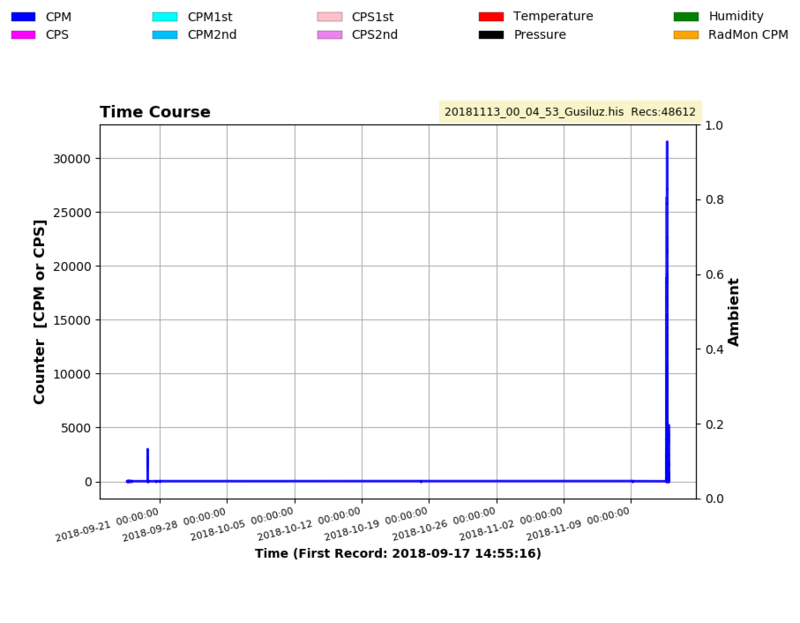 The first chart is an error due to the USB connection to PC. The second chart is an abdomen CT scanner performed with 78-110KeV. The GMC was with me in a leaded control area 16m far from the source. Even been far from the source, and in a leaded area the dose looks a bit high. The data from the third chart (November) is about the fluoroscope procedures. There should be two big chunks of data regarding the two operations. First one ( with long times of scope, more thank 10mins) started at 15:30 the 12th of November. Really? At 16 m from a CT scanner and behind a leaded area you are still measuring between 100 and 200 CPS? That is a lot of instantaneous dose (though the accumulated would not be so important I suppose). Xrays at 110 keV can be almost completely stopped (only 2% will pass) by 0.7 mm of lead. The difficult thing here is to assess how that count rate translates into a real dose in Sv or Gy, assuming that the calibration factor of the tube is wrong for 110 keV xrays (almost for sure it is wrong). If I have time I would like to look at tables that show the absorbed intensity by living tissue at 110keV, as the tissue is very transparent to that energy, so I suppose most of the dose rate would go to the hard structures (bones). Do you know the corresponding dose during the first 30 seconds of the graph (at an average of 900 CPS)? No, the first chart is not an error; this is what is stored in your counter memory! Your counter had been switched on and off multiple times during the period September to November 2018. Which software have you used to create the bin file? The data are interesting. Would you mind if I uploaded your bin file to my GeigerLog site, and make it available for download? As the machine switches on and off within seconds, we should ignore all the CPM data and use CPS only. Thankfully the counter does handle such a timeframe of seconds quite well. There is a burst of activities between 80700 and 80900 min, and an additional small burst some 3h later. But within it there is a much finer structure, as the 2nd picture shows as a blow-up of an only 5min timeframe beginning at 80812min. Out of curiosity, please, explain how this system works.The counter, I assume, had been placed in the position you had drawn into your graph, and not moved at all? And did the machine do the on and off switching all by itself - and if so, based on what conditions - , or did the operator do the switching? And when I glance over the 1st picture, I think I can see 5 levels of intensity. What determines these different levels? This is interesting. Each scan was described in general as lasting more than 10 seconds and totaling easily 10-20 minutes. 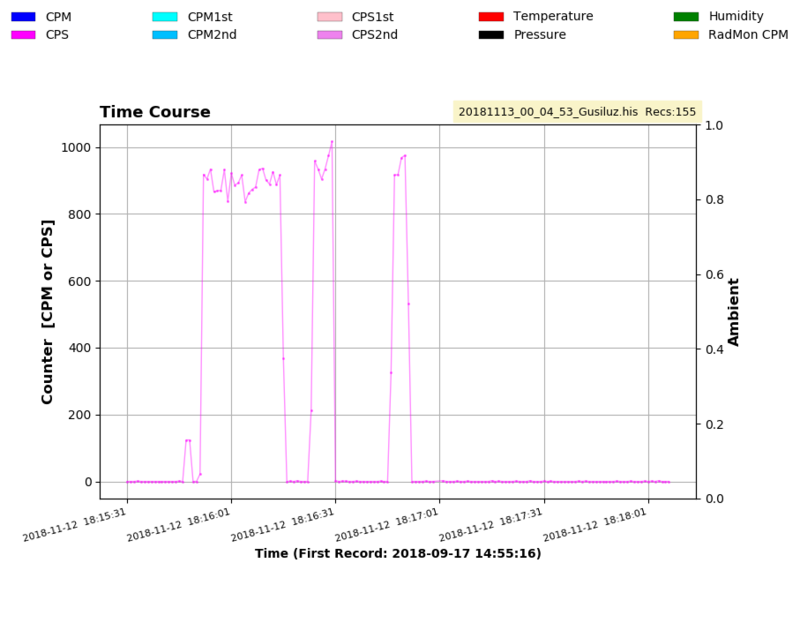 The graph posted by Ullix shows one operation/scan that lasted some 160 minutes, likely a more complicated one. The first exposure was 20 sec, then 10 sec off, 10 sec on, etc. Longer exposures might be for surgical placement of a device. More intense exposures perhaps for seeing detail in a dense area. I doubt the OP would be willing to give much detail on this one operation, but it would be interesting to learn if it is under manual control or automated in some way.